A chauffeur/bearer from Shrewsbury has raced round the world-famous Silverstone track – but without a racing car. 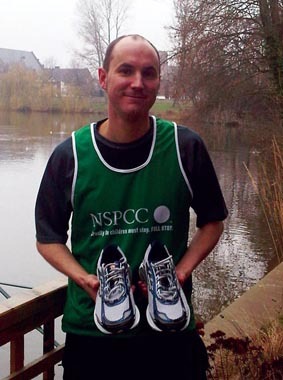 James Manders, who works for Pughs, took part in the Silverstone half marathon on Sunday, March 6 to raise funds for Childline and the NSPCC, to help children who need vital support and advice. “I ran because one of my friends from university challenged me to take part,” he explained. “Five of us were aiming to complete the course, all raising money for different charities. And we were competing to see not only who could finish in the fastest time, but who could raise the most cash. James is well known for his commitment to various causes and has been a volunteer for the Red Cross for the past six years. “I now help to train other Red Cross volunteers too, and regularly help out at public events including Shrewsbury Town football matches and an annual steam rally,” he said. Pughs managing director, Peter Forrest, said the company was very proud of James and his commitment to raising funds for such worthwhile charities. “As a company we are dedicated to supporting local causes and organisations, and James is a credit to our team as he gives up many hours of his own time to help other people,” he added.